notes from eleanor bloom: Dancing with the pollies! 'New Leadership' ... 'Old Moves'. We could make up the Rudd dance! "Let me just tell you this"
Well, the choreography was out for Howard's and Rudd's little dance on 7.30 Report last night. Howard's theme appeared to be arrogance - this leitmotif is also getting a bit stale I must say. JOHN HOWARD: Well, I'm not going to, OK, whether it's convenient or not, that's my position. SO NYAH TO YOU KERRY, YOU BIG WINDBAG! I'M STILL PM, HEAR ME ROAR! KERRY: But in truth, these cuts wouldn't be possible without the resources boom and China's insatiable hunger for our minerals. Now it's not something that you can really take credit for, is it, the resources boom and China's minerals needs? KERRY O'BRIEN: But it's a very substantial on, isn't it? KERRY O'BRIEN: But part of the reason you've got the lower unemployment is because of the resources boom taking up more jobs? YOU STUBBORN OLD FART! JOHN HOWARD: But Kerry, that's only part of the reason. The growth in the service sector of the economy has been much, much greater in, for example, financial services. Much, much greater. In hospitality, recreation and the like has been much, much greater than the resources sector. This is a glib one-liner to say that our wealth is entirely due to the resources boom. It's an insult also to the contribution that many people *wipes the tears from his eyes* *violin solo* in other sectors of the economy have made to our economic growth. So I reject entirely the argument that it's all about China. ELEANOR BLOOM: [to the tv] Financial services?!! Cause people working in the mining industry are earning so much bloody money! Hospitality?!! Every restaurant and cafe I go to hasa sign begging for employees! They have no one cause THEY'RE ALL IN THE BLOODY MINES CAUSE OF THE RESOURCES BOOM! THAT'S WHY BLOODY UNEMPLOYMENT IS LOW YOU STUPID OLD ARROGANT BUGGER!!!! JOHN HOWARD: Well, I don't know what Mr Rudd's going to do, that's a matter for him. He claims to be an economic conservative, I imagine, therefore, he believes in lower tax ... but look, what Mr Rudd does is Mr Rudd's business. KERRY O'BRIEN: OK. We will come to him in a moment. JOHN HOWARD: We'll leave him out of it for the moment. THIS IS ABOUT ME! I'M SICK OF HEARING ABOUT THAT BLOODY RUDD! ...AND DON'T MENTION THE POLLS!! KERRY O'BRIEN: But you do have to acknowledge the decline in the Commonwealth's share of public hospitals? JOHN HOWARD: Well, the amount that we've put into public hospitals has grown. The States have put more money in over the last few years. Some States have put a lot more in. ELEANOR BLOOM: Yes! The friggin states! The ones run by Labor! But apparently your argument for us not voting for Labor is because the country will be overrun by Labor.... Who you now say are taking better care of the hospitals than you have been for 11years in parliament. Aargh! KERRY O'BRIEN: Mr Howard, we're out of time, I look forward to the next of these. KEVIN RUDD: We'll be assessing what the Government's said but we'll be putting out our own approach to tax in due season. ...It's a very important policy, but we'll put our's out in due season when we're ready. ...Mr Costello today admitted that for months they've been working on this with the full support of the Treasury and out they plonk the official fiscal outlook and a tax policy within 30 seconds of doing so, a cautious and considered approach means we should do this in our own season. 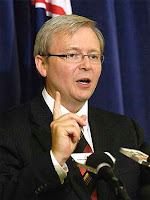 RUDD: ...in those critical areas, let me tell you, we'll have more to say, including on climate change and water. You can't just dream these things up at five minutes to midnight, which is what Mr Howard seems to be doing and plonking things on the table, expecting people to believe that he suddenly stands for acting on climate change and water, that he suddenly stands for reversing the tide on education, where disinvestment in our universities has stood out across the developed economies. Well, some people may fall for that, but you know something? After all these years in office I think people are starting to see through Mr Howard's tactics.